The year started with our first restaurant dinner at the Fort area courtesy of Murray’s New Orleans Bourbon Street Steaks and Oysters. Dinner was rather reserved as Hubby and I are on a diet and wanted to start the year right. Plus, we had a weigh in and a Boracay trip to consider. Losing weight has been made more attractive by a bet we had with my sister-in-law and his hubby. The bet is to lose the most weight as a couple by March 31. The weigh-in transpired midnight of December 31. The prize? An airplane ticket to Boracay. Anyhow, New Orleans is owned by the Red Crab group of Raymond Magdaluyo. It is inspired by the Cajun style of cooking famous in the New Orleans area. This is our 2nd time in this restaurant. 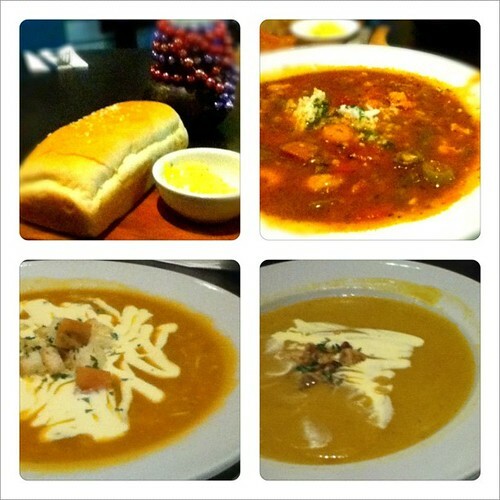 For appetizers, we each had soups – Death by Gumbo, Roasted Pumpkin soup and Crab and shrimp bisque. We also ordered a shrimp and corn beignets. The Death by Gumbo is a creole cajun stew of shrimps, shellfish, oysters, chicken, andouille sausage, tomatoes and okra. With a small amount of white rice in the middle, this is a good appetizer to experience New Orleans cooking. The Crab and Shrimp Bisque and Roasted Pumpkin soups were also equally tasty. Unfortunately, the shrimp and corn beignets arrived late (after we’ve eaten the entrees) and were ‘blahs.’ These beignets are doughnut shaped appetizers with shrimps, corn and parmesan cheese inside. Didn’t taste any shrimps though. The doughnuts were also bland and heavy. For entrees, we had them to share – Fish and Shrimp Ponchartrain, Tyler’s Black and Gold Oyster Pasta and Porx’s Pork Belly. The Fish and Shrimp Ponchartrain comes with walnut parsley rice which I adore. 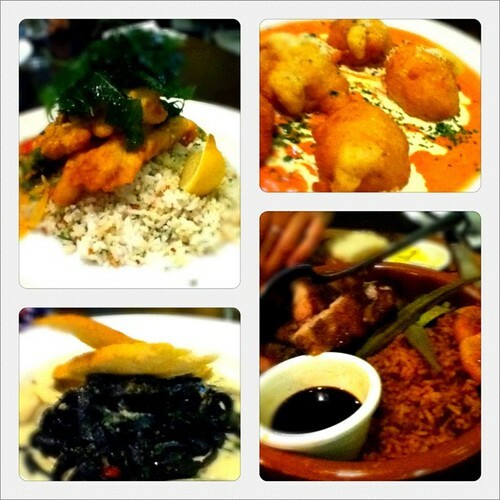 The dory fillet was cooked well and I liked the etouffee cream and lightly fried spinach on top. I love truffle cream. Hence, I ordered the Tyler’s black and gold oyster pasta. It came with freshly made black pasta and a good serving of truffle cream and roasted garlic. Porx’s Pork Belly is our version of Filipino pork belly. Would have chosen another dish if we knew what it was.